How are symbols / annotations added to the structural elements for a Top/Bottom view? Most of the time, when we have to create a big structure, with many levels and many structural elements, adding formwork symbols to a "Sectional drawing" or to a "Top / bottom view" could become an activity that requires a lot of time. Advance Concrete provides a feature that was designed to speed-up this process. Advance Concrete provides the option to set the desired formwork symbols for structural elements, before even creating the drawing. 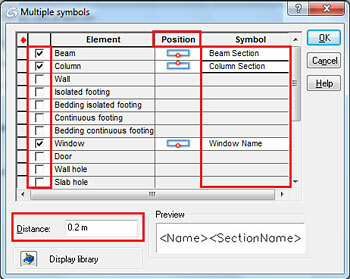 To set the default formwork symbols for structural elements, we have to choose them during the creation of a "Top / Bottom View", "Sectional View", or "Elevation". For this example we will assume that we want to create a "Top / Bottom View" for an existing structure. 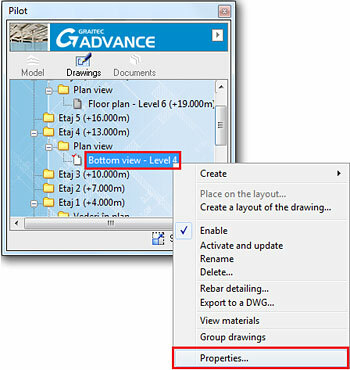 In the "Top-Down plan view wizard" click the "Next" button until Advance Concrete displays the last dialog window named "Visual Elements". 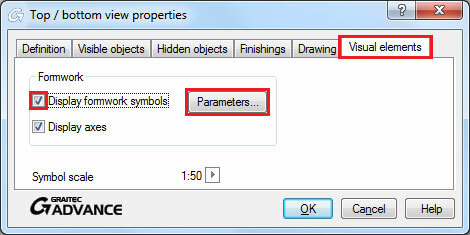 To add formwork symbols for an existing drawing go to its properties page, on the "Visual elements" tab, check "Display formwork symbols" and click the "Parameters..." button to set the desired symbols. After the "Parameters..." option is accessed, a new dialog window will appear. Next we can choose the desired structural elements for which we need symbols, the position of the symbol relative to the structural element, and the type of symbol. Also we can set the distance between the symbol and the formwork. This option is very useful especially when the Top / Bottom view already has many dimension entities because all the annotations will be placed at a fixed distance from the formwork elements so the annotation text will not overlap the dimension text. 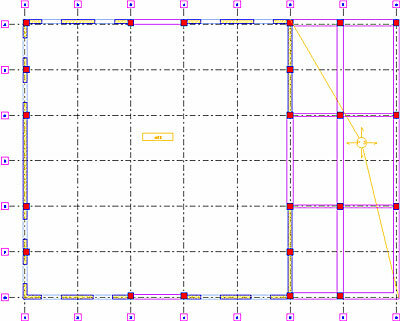 We will assume that for our detailing job we have to place symbols only for beams, columns and windows. 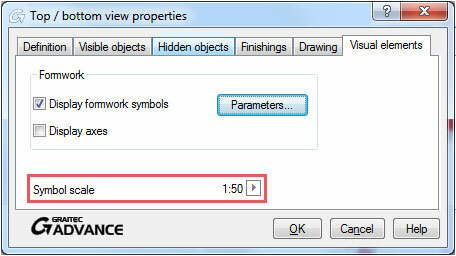 After this dialog box is closed, you can also change the scale for these symbols. Another way in which you can label the Top/bottom view is by using the "Create a symbol" option from the "Advance symbols and annotations" or from "Advance Views" toolbars. By using this option, Advance Concrete allows a better control over the symbol because it lets us edit it (we will be able to edit the text - text type, text height, and we will also be able to edit the symbol by adding extra attributes). After you edit the symbol, you can save it for use on later projects. In the "Save symbol" dialog box give the new symbol a name and choose the path where the symbol will be saved. The new symbol can be found in the symbols library. 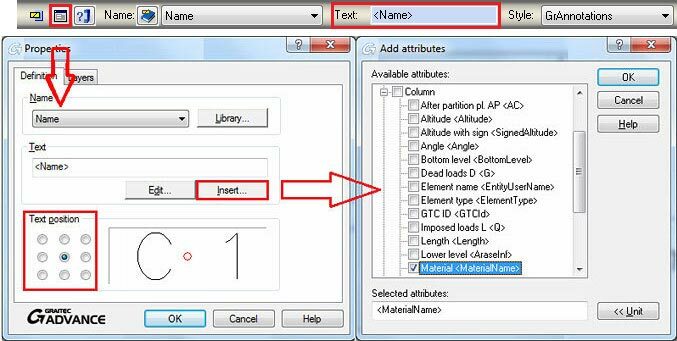 Advance Concrete users can also add annotations on formwork elements by using "Create an annotation" for a single element or "Create multiple annotations" which is used for adding annotations for multiple elements at the same time. 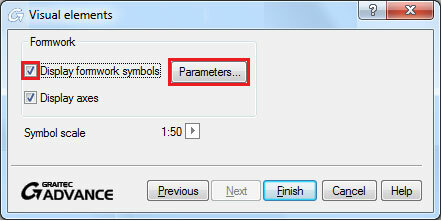 These functions can be found on the "Advance symbols and annotations" or "Advance Views" toolbars. In this example we will create a single annotation for a column. After we select the formwork element, we can edit this annotation using the smart bar options or using the properties window. Also, by using the properties window you can modify the text position, or you can insert multiple attributes.